On 18 October 2017, speakers from three continents joined a webinar initiated by the World Bank and the Clean Technology Fund and hosted by Spanish-based consultancy ATA Insights to talk about opportunities for concentrating solar thermal in industry. Martin Haagen from Industrial Solar, a German-based Fresnel collector manufacturer, analysed solar heat in industry at the macro-level. Rodrigo Mancilla, Executive Director of the Chilean Economic Development Agency, CORFO, gave his thoughts on solar heat in mining, and Eyas Al-Zadjali, Project Development Manager at Glasspoint based in Oman, spoke about the ongoing construction work for Miraah, a plant to generate solar steam for enhanced oil recovery. 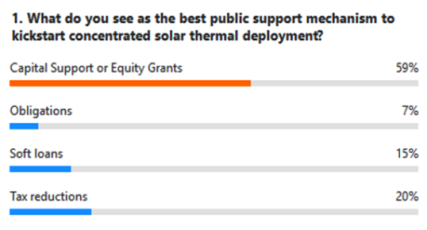 Additionally, opinion polls during the event asked, for example, what the around 270 participants thought was the best public support mechanism to kick-start concentrating solar thermal deployment (see the screenshot above). The webinar was part of the World Bank’s 3-year CSP Knowledge and Innovation Program launched in late 2016 to provide public utilities and industries across the MENA region with financial and technical advice on CSP investment. “Technology isn’t the bottleneck” was the clear message Haagen intended to send. “Solar concentrating collectors can already compete with non-subsidised oil products today.” He presented a reference case from Jordan, where Industrial Solar set up a turnkey installation at pharmaceuticals producer Ram Pharma. 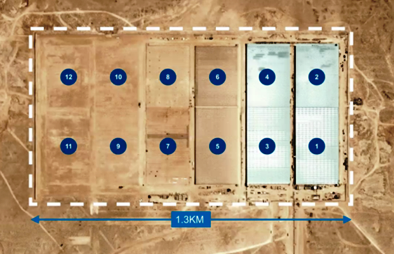 Plan for the first phase of Miraah, Oman: The generation capacity of the 12 blocks, of which 4 are always operated jointly as one module, is 300 MW, a third of the total planned investment by state-owned Petroleum Development Oman. The last speaker, Eyas Al-Zadjali, joined the webinar from Oman in the Gulf region, where his employer is currently constructing what will become the world´s largest solar steam plant at 1 GW capacity. The structure is divided into blocks, and four of them are always run together. The greenhouses of the first four blocks were completed in September 2017 (see the photo above). The project is on schedule and on budget, Al-Zadjali confirmed. Steam has already been produced directly from water at high TDS levels (TDS = Total Dissolved Solids). The 12 units are expected to be up and running by the end of 2018 and will have a production capacity of 300 MW. “We use the greenhouses as a factory and can finish 200 metres of receiver tubes and concentrators each night,” explained Al-Zadjali. 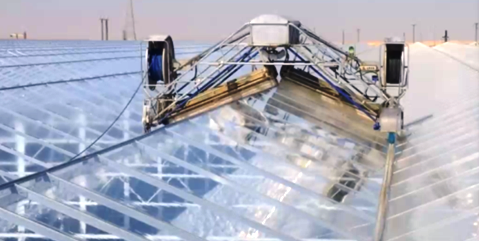 “During construction, we leave the dust on the glass roofs to reduce the intensity of sunlight entering the greenhouses.” During operation, however, robots will automatically clean the roofs each night (see the photo below).